Meet the World Market Leader! The company FESSMANN, world market leader for hot smoking systems, will exhibit on Agroprodmash 2018. The manufacturer from southern Germany will show the latest model of its tried and tested universal plant T3000. With highest capacities and flexibility, the system is suited for artisanal and industrial usage both. Additionally, FESSMANN will present its patented smoke generator RATIO-TOP and the innovative control system FOOD.CON. The T3000 by FESSMANN is one of the most successful universal systems worldwide. 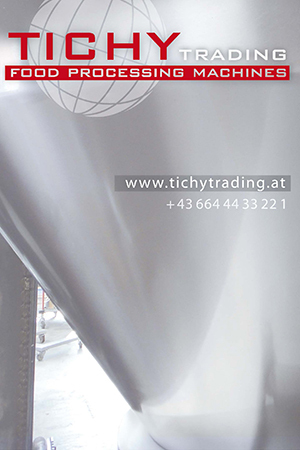 From drying and reddening of the products over cooking, smoking and cooling processes – everything is possible in only one single machine. The all-stainless-steel made system convinces by high-quality manufacturing and frequency converter by default, enabling a stepless adjustment of the fan speed on the products specific needs. Not only the flexibility, but also the power of the T3000 is astonishing: By highest volume flows of up to 5.200 m3/h the air inside the chamber is changed 26 times per minute completely! The T3000’s special TRIPLEX-insulation ensures best energy-efficiency. The combination of high temperature insulation plates, PU-foam and stainless steel decreases the u-value (thermal transmittance) of the machine’s walls and ceiling down to 0,36! For comparison: Insulation with mineral wool causes a u-value of 0,64, without insulation it is 12,81. Additionally, an automatic cleaning system is integrated by default; a climate package for maturing processes can be added as an option. Besides the T3000, FESSMANN will present its smouldering smoke generator RATIO-TOP on Agroprodmash 2018. This smoke generator distinguishes itself by the patented TOP-device, a component unique in the industry. It enables to switch between multiple smoke variations and intensities easily, to meet the products specific needs at all time. While doing that, the RATIO-TOP does not only change the smoke’s concentration: By smouldering the wood chips at different temperatures, the smoke’s characteristics can be changed as well. Thanks to this principle an unmatched variation of colours and flavours can be achieved. Additionally, the RATIO-TOP has a very economic consumption of wood chips. Using the setting “light smoke” for gentle smoking processes the smoke generator uses only about 1,62 Kg smoking agent per hour. Another highlight is the modern FOOD.CON touch panel. The simple-to-use control system ensures the best uniformity of all batches and enables an easy and ergonomic control of the machine. Saving and starting up to 99 processes by only one click prevents mistakes and accelerates the production flow.